“Thing I find in the garbage” and its writer (me) were featured in an article in the weekend edition of the Montreal Gazette. 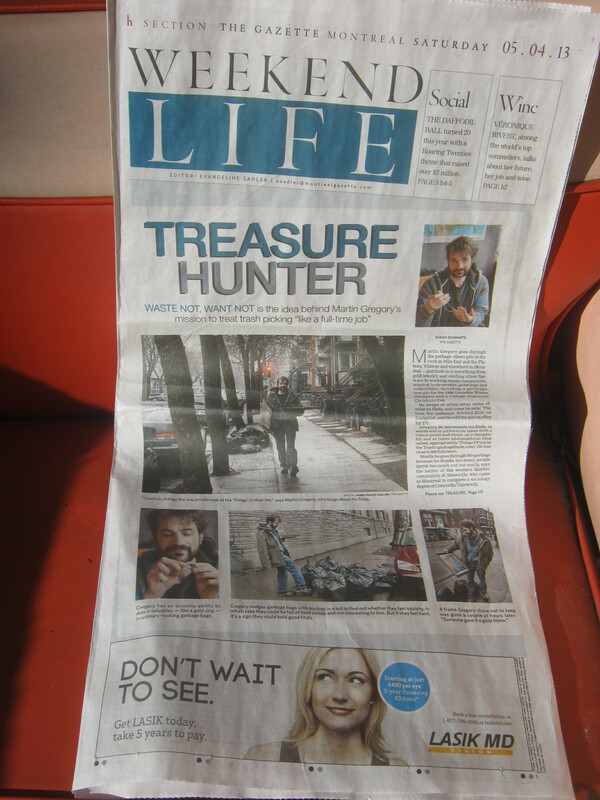 I was mentioned on the first page and took up the cover and page three of the “Weekend Life” section. I’m pretty happy with how it turned out and it definitely brought some attention to the blog – I broke my records for visitors (311) and views (1357). I promise I won’t go mad with my moderate amount of fame! If you’re interested you can read it online. You can see the various articles written about the blog in the “Press” page under my “About” tab. In other news I made some much needed repairs on my bike at the Santropol Co-op. I fixed the brakes which were in pretty pitiful condition, replaced the front tire (a pre-emptive strike against a tire that was becoming dangerous), and raised my seat. I had been a bit negligent with my bike but I’m somewhat caught up now, though I still have some work to do with the gears. Just a reminder that if you have an old bike, even if it’s in rough shape, it may be of use to a bike co-op. Santropol for instance guts old bikes for parts and recycles the stuff that is no longer used. They definitely do their best to waste less and it’s a good place to donate an old bike. I’m sure you can find similar bike co-ops in other cities as well. If you can’t drop it off you can always put it on the Craigslist free section and maybe someone will come pick it up. I’ve spent the day leisurely cleaning my room while sort of watching the Blue Jays play a good game for once. I’m thinking I might have another yard sale next weekend, but I’ll keep you posted. I also sold a silver perfume bottle I found a couple weeks ago to a reader for 15$. The weather has been ridiculously nice. I’m definitely going to bike up to Rosemont tomorrow morning, or maybe even tonight if I feel like it. There isn’t as much trash at night but it’s definitely a little more relaxed. Excellent article, fun pics, interesting video! I am also a finder but am particularly good at discovering name brand clothing,handbags.jewellry and oddities of good and great quality.I have a few venues for my stuff but it is not a lifestyle.More like a hobby.Any thoughts or suggestions?Greatly appreciated. btw Congratulations! I love your blog. I’m surprised one doesn’t point to the other. I’ve talked to two non-students who live in the area, and they talk of opportunity, not “garbage”. For that matter, there is a guy who lives around there who looks for garbage, and on Tuesday when I saw him he’d just found two boxes of fundraising type chocolate bars. He routinely has a garage sale to sell of the stuff he finds, sometimes organizing with others for a community type sale. Clap Clap Clap!! I loved reading about you and your trash!! You need a trash cart I tell ya what!! You’d be hauling all the good stuff! !